If you need to find a dialup number for the area you are moving to you can go to our list of numbers here, or contact us by phone or email. NOTE: Pacific Online is not responsible for any toll charges incurred. If you have any doubts as to whether a phone number is local for you or not, please check with your operator. 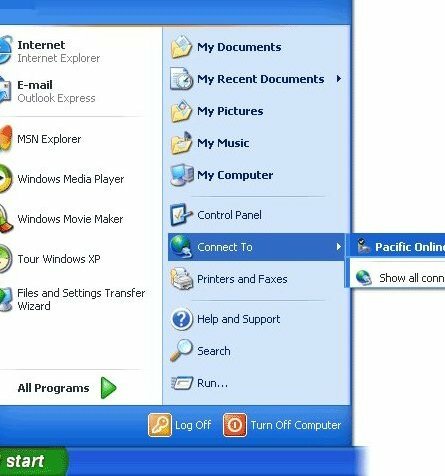 If you installed a Dial Up connection using Pacific Online's Portal Software from CD the only way you should change your dialup number is in the actual portal software under "Settings". This option will be available as an icon from the main Portal window. Do not attempt to change the phone number in your Dialup Networking folder. 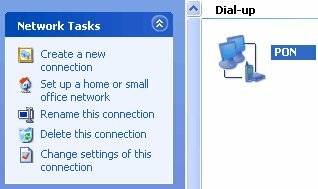 Double-click on My Computer, then find and double-click on Dial-Up Networking. Locate the Pacific Online icon (or whatever icon was made to connect to Pacific Online). Right-click on Pacific Online then select Properties. Here is a screenshot of what you should see if you do this correctly. Erase the phone number listed on the window and enter in the new phone number. Do not enter an area code unless you are absolutely sure that you need to dial an area code (if your local phone setup requires it, or if you are purposely dialing a long-distance number). Click OK and you are finished. Double-click on My Computer, then find and double-click on Control Panel. 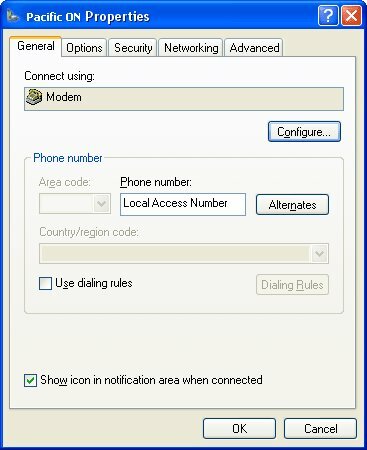 If you are using Windows 2000 locate the Network and Dialup Connections icon and double-click on it. 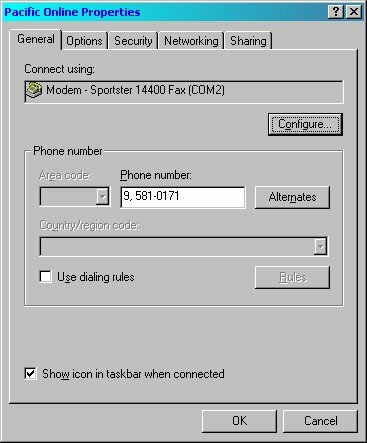 If you are on Windows ME find and double-click on the Dialup Networking icon. In Network and Dialup Connections or Dialup Networking right-click on Pacific Online and select Properties. Here is a screenshot of what you should see if you did this correctly. This screenshot is of the Windows 2000 Pacific Online properties but should look very similar on Windows ME. On the first window erase the phone number and replace it with the number you wish to use. Click OK and the change is complete. Part A. Click the Start menu button at the bottom of the window. A menu will then open. Now, move the mouse pointer to Connect To. Another menu will open. Next, click on Show all connections. Part C. Delete the old dial-up number from the Phone number: box and enter the new phone number. Our national 56k dialup numbers are found here. Click the OK button. Your new dial-up phone number is now saved. Open your Apple menu, then select Control Panel, then click Remote Access. Click the triangle located at the upper-left side of the window if you do not see what this screenshot shows. Erase the phone number listed here and enter in the new phone number you wish to use. Also, if you need to change your username and/or password this would also be the place to do so. However, if you need to setup your Macintosh to connect to us from scratch you should run through the Internet Setup Assistant.